The history of the Hebrew alphabet dates back several thousand years. According to contemporary scholars, the original Hebrew script developed alongside others in the region (the region is the Land of Cannan and Arabia) during the course of the late second and first millennia BCE; it is closely related to the Phoenician script, which itself probably gave rise to the use of alphabetic writing in Greece (Greek). It is sometimes claimed that around the 10th century BCE a distinct Hebrew variant, the original "Hebrew script", emerged, which was widely used in the ancient kingdoms of Israel and Judah until they fell in the 8th and 6th centuries BCE, respectively. It is not straightforward, however, to distinguish Israelite/Judahite scripts from others which were in use in the immediate area, most notably by the Moabites and Ammonites. Following the Babylonian exile, Jews gradually stopped using the Hebrew script, and instead adopted the "square" Aramaic script (another offshoot of the same family of scripts). This script, used for writing Hebrew, later evolved into the Jewish, or "square" script, that is still used today. Closely related scripts were in use all over the Middle East for several hundred years, but following the rise of Christianity (and later, the rise of Islam), they gave way to the Latin and Arabic scripts, respectively. 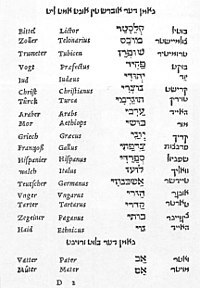 The Hebrew alphabet was later adapted in order to write down the languages of the Jewish diaspora (Karaim, Judæo-Arabic, Ladino, Yiddish, etc. ), and was retained all the while in relatively unadapted form throughout the diaspora for Hebrew, which remained the language of Jewish law, scriptures and scholarship. The Hebrew alphabet was also retained as the alphabet used for writing down the Hebrew language during its rebirth as an everyday modern language starting in the 18th to 19th century. According to one Jewish tradition, however, the block script seen today in Hebrew Torah Scrolls, known as Kthav Ashurith, was the original Hebrew script carved into the Ten Commandments. According to this opinion, the Ktav Ashurith was lost over time, as the masses used Paleo-Hebrew and its cousins, known as Kthav Ivri, for day to day writing, just as Jews today use a non block script for everyday writing. According to the Talmud, the original script was known as Lebonae and was associated with the Samaritan community who continued to preserve the script even after the Jews switched to Ashurith. A replica of the Gezer Calendar in the Israel Museum in Jerusalem. ^ Deem, Rich (June 2006). "Early (10th Century B.C.) Evidence of Written Hebrew Language at Tel Zayit, Israel". God And Science.org. ^ "Hebrew - (12th century BC? - today)". Mnamon Ancient writing systems in the Mediterranean A critical guide to electronic resources. ^ Rollston, Christopher (April 2018). "The Oldest Hebrew Script and Language". Biblical Archaeology Society. ^ NOBLE WILFORD, JOHN (November 2005). "A Is for Ancient, Describing an Alphabet Found Near Jerusalem". The New York Times. ^ Jewish Encyclopedia: Alphabet, The Hebrew: Samaritan Alphabet: "While the Jews adopted the Aramaic alphabet, gradually abandoning their own, the Samaritans held fast to the original forms, in order to show themselves the veritable heirs of ancient Hebraism. ... It is the same character used in all the Samaritan books of to-day, and remains the only offshoot of the old Hebrew script extant, while the modern Hebrew Alphabet is of Aramaic origin." ^ Babylonian Talmud, Tractate Shabbat 104a, Tractate Megilla 2b. "Rav Chisda says that the (final) mem and samech in the tablets were miraculously hanging in the air." This can only happen in Kthav Ashurith and not in Kthav Ivri. ^ Babylonian Talmud, Tractate Megilla 3a. ^ Klein, Reuven Chaim, Lashon HaKodesh: History, Holiness, & Hebrew. Mosaica Press 2014. pages 185-205. ISBN 978-1937887360. ^ A second print letter is the form found at the end of a word. ^ A second braille letter corresponds to the letter plus dagesh (dot) in print. This page was last edited on 8 October 2018, at 09:25 (UTC).